When I first heard of this, the first 2 words that came to mind were "publicity stunt". I, for one, never care for publicity stunts. They always have the opposite of the desired effect. I'm so ticked I won't watch the new show now. Well I will give the new show a chance, but I'm with Beth on saying Kermit and Piggy forever! I just don't see the show working on the premise of Kermit and Piggy being in a happy relationship. They need to build to get that back, and that's going to add to this series. Duke Remington, charlietheowl and Rugratskid like this. Setting - Kermit and Piggy's home, the one seen in the Muppets Movie. Kermit, dressed in a bathrobe, sitting at his desk in front of a computer. Piggy walks into the room, also in a bathrobe over a nightgown; carrying two cups of coffee. She places one down on the desk and sips from the other as she watches Kermit scrolling the web and reading all the news stories about the "breakup". Kermit turns to look at her and gives her a small smile. She leans down and they share a sweet kiss - the only light in the room falling upon them from the monitor. Yeah, the breakup isn't real. It's a joke. A joke on us. Nope, not buying it. Disney/ABC will not break up the best Muppet couple. Happily ever after for my Kermie and Piggy. I have a feeling that Kermit and Piggy are destined to be the new Ross and Rachel. 'Friends' just keeps coming to mind. And if that's the case, I can't wait to see it play out!! Duke Remington and LaniArianna like this. Duke Remington, LaniArianna, Katzi428 and 1 other person like this. I am a little disappointed with Disney over this. As an adult I can see the benefit of the good plot line, Ross & Rachel etc; and don't get me wrong the candid on and off relationship played out between the pair on The Muppet Show and the films was always spirited but resolved within 30 - 90 mins. However, I feel a public display is irresponsible to their younger audience. Disney wouldn't do this to Mickey and Minnie or kill off Tinkerbell by releasing a press statement that the magic kingdom no longer believes in fairies. I'm willing to bet there's going to be a storyline where it turns out they're legally married from MTM and never realized it over all these years. LaRanaRene, MUPPETFAN1976 and LeanneRivett like this. LaniArianna and LeanneRivett like this. It's certainly a publicity stunt, but I also think it's probably-necessary setup for the new show. Partly, as someone above suggested, to keep with the "reality show" illusion, but also because some (many?) people would be confused if they don't actually see the breakup, but the show begins after it... So by establishing the fact beforehand via social media, they can skip it and launch straight into the post-breakup plot from the start of the series. Katzi428 and LeanneRivett like this. "reality-show illusion" Gotta love those 3 words. Reality shows are anything BUT reality. Keeping up with the Crapdashians is one example of "reality illusion". I really hope they do better with this than that lousy show. I just wish it wasn't the format they are going to use. Show, then break away to comments then show, then break away.. Not crazy about that. And because the photo book version of MTM includes the cut scene of Gonzo telling Kermit the marriage was real. Because even without that scene, it's clear what the movie is implying by Piggy's giggle to Kermit. She didn't replace Gonzo with some random actor. That wouldn't make much sense as a plot point or a joke. She replaced him with a real minister. And because Piggy calls Kermit "hubby" in the 30th anniversary special. Our "headcanon" has more than enough precedent. Wake me up when there's any Bunsen/Beaker news. Now that's publicity worth checking out! Uh oh! These fictional characters are doing something! How dare they! Duke Remington, MuppetsRule, WalterLinz and 4 others like this. The response here is silly. Why are people taking this to heart? 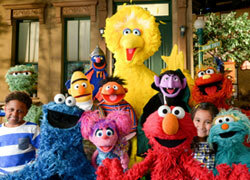 The Muppets have merely promoted the premise of their new show at the TV upfronts. Kermit and Miss Piggy always had a strained relationship on the Muppet Show. Why should this one be any different? This keeps things fresh and interesting instead of what's happened for the last several years with this stale relationship stuff. This is the best thing that's happened to the Muppets in years. Duke Remington, MuppetsRule and Drtooth like this. 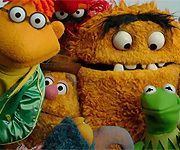 Most all Muppet fans that post on here know that they are fictional characters, and that they are puppets. However they still believe in the relationships because they are so believable. I for one have loved the Kermit and Piggy dynamic in every show and movie they have done together, and if this breakup leads to more depth in there relationship then I'm all for it. I also have changed my signature in support for the couple. Duke Remington, LeanneRivett and MUPPETFAN1976 like this. As Kermit once said on the Jim Henson hour, He and Piggy never had that kind of relationship!